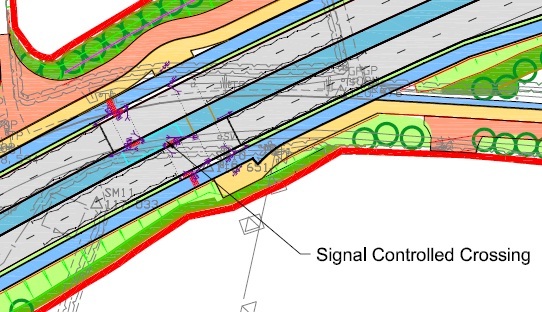 The scheme layout shows that there will be a 3m wide footway on both sides of the dual carriageway and it will be separated from the road by a verge/hard shoulder. This footway will be shared use so cyclists will be able to use it. 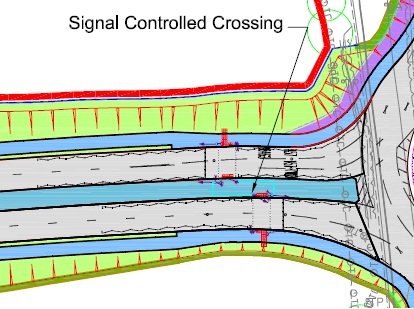 Footways are shown in blue in the image below, the central blue strip is a central reservation. The footway continues behind bus stops so there is no conflict between bikes and busses. There are often problems with off road cycle paths at side roads as priority is often given to vehicles on the road and sight lines are often poor. 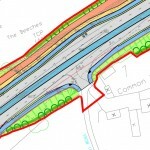 There are only 3 side roads along this scheme, lets see how they are dealt with. Not very well… as usual no priority, poor lines of sight as cycles are taken around the corner to a narrower part of the road. Hopefully these won’t be too much of an issue as only low levels of traffic should ever use these side roads. There are some toucan crossings to allow people to cross by foot/cycle/horse. The first will be a staggered two stage crossing, priority with lights. The second will be another staggered 2 part crossing with priority given by lights. There is a bridleway that crosses this road, I doubt many horses will like to be sat in the central reservation waiting for the second light. How comes horses don’t have a zig zag crossing like pedestrians and cyclists? Perhaps they are smarter and don’t need to be caged in to prevent them crossing in one go…? 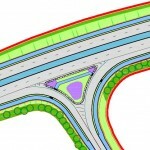 The biggest junction on the scheme is a replacement of the current crossroads with a roundabout. Cyclists seem to have been added as an afterthought. We have bad lines of sight, no priority when crossing, no signals to give priority, and staggered crossings. To go straight on from East to West cyclists need to make 3 crossings, the oposite direction only two crossings are needed. 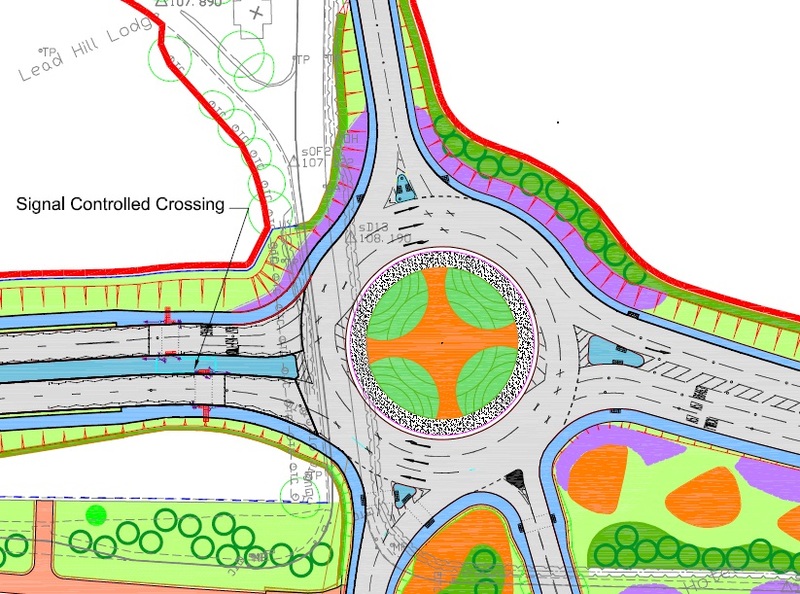 It seems to me that the designers of this roundabout don’t know how to design for cyclists at roundabouts, they take the easiest solution and take cyclists half way down the side road and give them an uncontrolled crossing point. Drivers using the roundabout don’t see them, cyclists crossing don’t see the drivers. Sounds like a great idea. 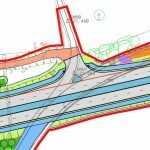 All in all, this should make this road much much safer for cyclists but I think we’ve got quite a way to go before cycling is factored into these types of schemes from the outset and designed well.